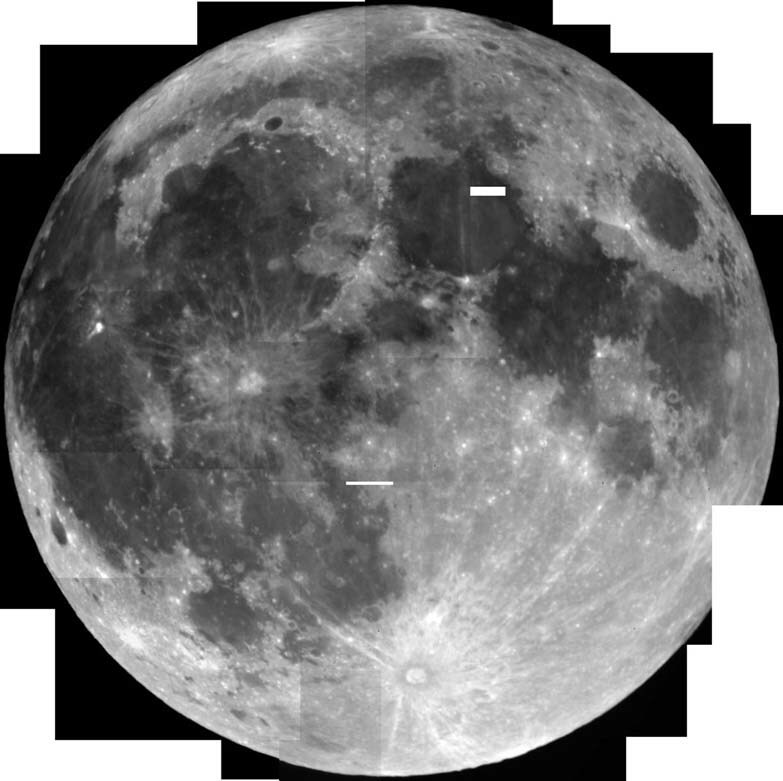 On Friday night, February 21, 1997, Tom spent about four hours taking photos of a nearly full moon. 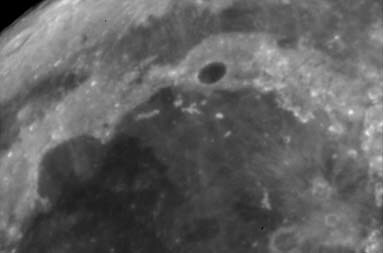 The photos were shot using a Meade Pictor 416, which is a digital camera based on a Kodak CCD chip which takes 768x512 16-bit grayscale images. The telescope is a Meade 7" Maksutov-Cassegrain LX-50. It took about 30 photos to cover the Moon (or rather to almost cover the moon). I took about 30 photos, manually aiming the camera and marking off approximate areas covered with each shot. 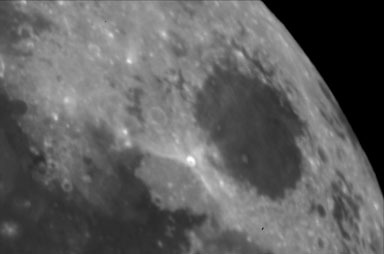 I like this image because it shows some dark areas, some light areas, some craters, and a portion of the outer edge. 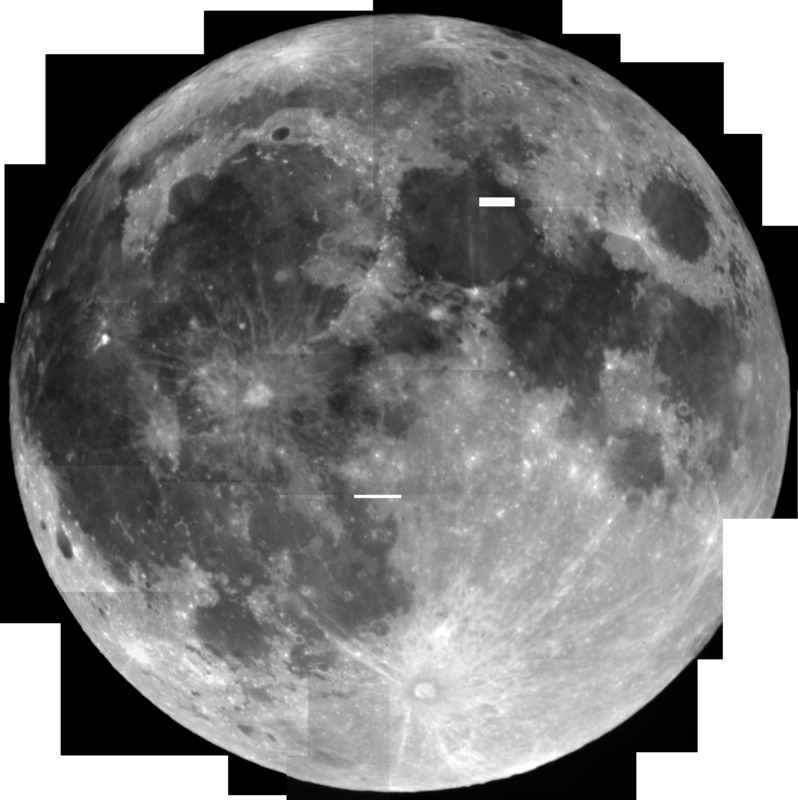 This image shows that the moon indeed is not quite full. The sun is rising over the craters in the upper left hand corner of the image. You can also see this in the full mosaic. As you can see below, I missed two small rectangles in the interior of the Moon, and one chunk of the perimeter. I composed the 30 photos into one mosaic using Adobe Photoshop 3.0.1 on a Power Macintosh 8500. Each image had to be adjusted for brightness and contrast (actually, I used the Adjust Levels features in PhotoShop to match the light and dark areas of each image). Still, you can see the boundaries of the individual images in a lot of places. Personally, I think that makes it cooler, since it's obvious I didn't just go out there with an instamatic and snap a photo, but you can decide for yourself. The final image was about 6MB of data covering 2500 pixels square, which would be about 25 or 35 inches square, depending on your monitor. To accommodate the bandwidth of the Web, and the convenience of viewing on a monitor, I reduced the size and JPEG compressed the image down to about 800 pixels square and a svelte 65K. If you're so enthralled with this image that you want to see more, download the high resolution version. It's full resolution, but JPEG compressed on a high quality setting so it's only 519K (using the "medium" setting cut the file size in half, but lost a noticeable amount of detail). Try looking at it in both 1:1 and 1:2 zoom factors. 1:2 looks sharper than 1:1, but 1:1 shows some detail areas more clearly. To download the image so that you can view it in PhotoShop, for example, click on the link and hold the mouse button down until a menu comes up (Mac) or click on the link with the right mouse button (Windows). This trick works with both Microsoft Internet Explorer and Netscape Navigator. Or you can load it up in your browser, then click and hold on the image (Mac) or right click on the image (Win) and you'll get a similar menu that will also let you download the image to a file.